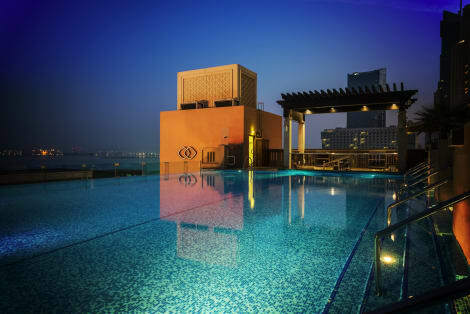 The 5-star luxury Bonnington Jumeirah Lakes Tower hotel in Dubai is located near the popular Jumeirah beach. Close by is the Mall of Emirates, Marina beach and the Ibn Battuta Mall. Inside the hotel there’s free wi-fi, a fitness centre, a hairdresser, a sauna with terrace, a pool and Jacuzzi. The nearest Dubai Metro and Tram stations are within easy walking distance. There are two on-site restaurants, an Irish bar, a pool bar and a café lounge to choose from. From the 31st Mar 2014 a Tourism Dirham fee will be charged on all stays in Dubai hotels, this will be collected at check-out by the hotel and will be charged per bedroom, per stay. 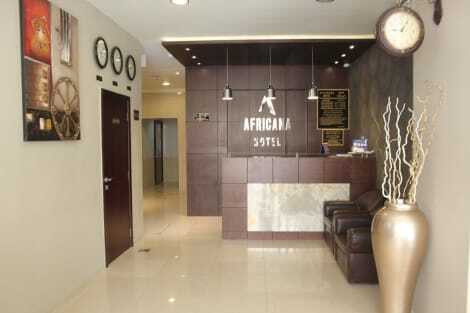 The fee amount for this hotel is 20 AED per bedroom per night. Situated in the heart of historic Dubai, this urban oasis is ideally located within a walking distance from the main commercial and shopping districts. Just a few minutes from Dubai International Airport, the Dubai Museum, Dubai Creek, the Heritage Centre of the city and within walking distance from the new Gold Souk, you are at home in this bustling metropolis. First Central Hotel Suites is located in the heart of Tecom one of Dubai’s leisure and business districts. Only 5 minutes walking distance from Dubai Internet City metro station, close to Mall of the Emirates and Ski Dubai, Dubai Media City and Dubai Internet City. With its exotic decor, featuring a rooftop pool, a gym, and steam with panoramic views of Dubai, our hotel offers a rooftop panoramic restaurant and a ground level restaurant/deli café. 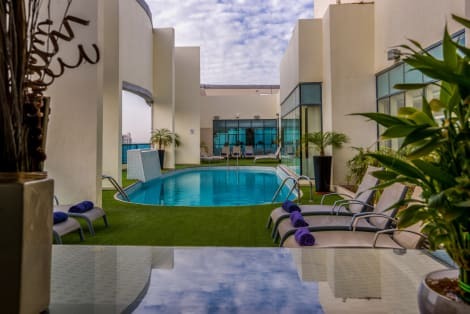 Close to Jumeirah Golf Estates, Dubai Sports City and the Meaisem City Center Mall, the Ghaya Grand Hotel Dubai is a contemporary 5-star hotel found in one of Dubai’s fastest growing areas. Combining luxurious sophistication with a focus on wellness, the hotel’s 5 bars and restaurants serve gourmet cuisines, and you’ll also find a state-of-the-art gym, tennis court and outdoor pool. Ghaya Grand Hotel Dubai’s contemporary rooms have LED TVs, wi-fi access and tea and coffee facilities. The hotel features 230 spacious and comfortable rooms and suites with a different view of the Dubai shoreline from various heights and directions. 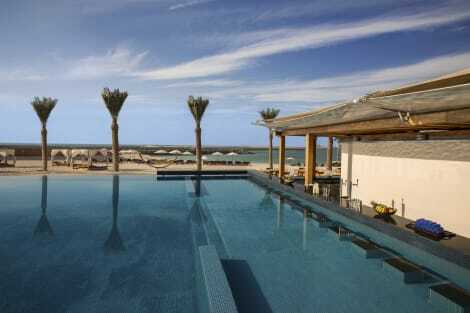 With bedrooms separate from the seating area, Rixos The Palm Dubai offers space and privacy for families. Fu rthermore, the Resort has a range of restaurants, lounges and bars overlooking the ocean as well as a comprehensive and sophisticated banquet and meeting space. Be welcomed with a warm chocolate chip cookie upon arrival at the DoubleTree by Hilton Hotel Dubai – Jumeirah Beach. Located on Jumeirah Beach's "Walk", the hotel features its own private beach and is within walking distance of a variety of open-air cafes, restaurants, craft vendors and shops. Business hubs including Jebel Ali Free Zone, Dubai Media City and Dubai Internet City, are all within easy reach of our stylish Jumeirah Beach hotel. Play a round of golf on the magnificent Emirates Golf Course, shop in the Ibn Battuta Mall, both close to the hotel or take the nearby metro further afield to admire iconic Dubai attractions like the Burj Khalifa.All of the spacious one, two and three-bedroom suites at this contemporary Jumeirah Beach hotel feature amenities to make you feel at home, including a balcony, air-conditioning, an ergonomic work desk and WiFi. Host a successful event at this hotel in Dubai with six flexible meeting spaces and stay productive in the modern, 24-hour business center. Start your day with a breakfast buffet in the relaxed, all-day dining restaurant, The Kitchen, savor Arabic specialties in Al Maeda restaurant and enjoy a snack or a cool drink in the pool bar. Energize with a workout as you gaze out over the Arabian Gulf in the complimentary 24-hour fitness center or swim in the shimmering waters of the temperature-controlled outdoor pool. Our Jumeirah Beach hotel also offers luxury spa treatments, the perfect way to unwind after a busy day. The bedrooms at Media One have a dynamic sense of style and are a world away from being ordinary. They boast amazing views of the Arabian Gulf and the iconic Palm Jumeirah, or, on the other side, overlooking the Emirates Golf Club. All the facilities are synonymous with an upscale hotel with vast amounts of hanging space, a selection of gadgets and internet access plus all the regular amenities for our guests. Our hotel accommodation in Dubai also includes flexible working desk, in-room bar. Located on Palm Jumierah’s eastern crescent, the 5-star Anantara The Palm Dubai Resort overlooks a 400-metre stretch of sandy beachfront. Designed in a contemporary Asian style, the resort has 4 restaurants, lagoon-style pools, a spa, Turkish bath and 2 gyms, as well as entertainment options like Thai cooking classes and water sport activities. 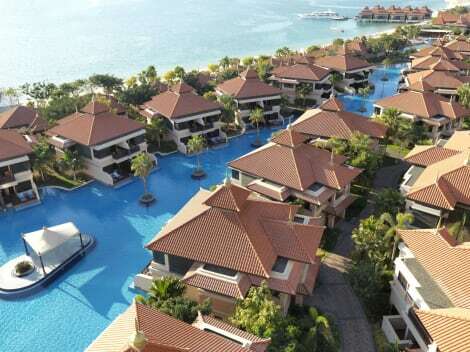 Rooms and villas have floor-to-ceiling windows, smart TVs and free wi-fi, as well as private terraces or balconies. 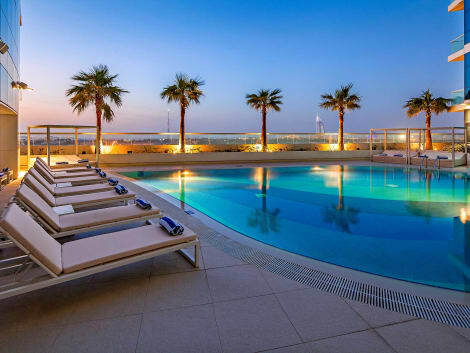 Ramada Plaza Jumeirah Beach, a deluxe 4-star hotel located between Jumeirah Beach Residence and Dubai Marina, offers 360 units including Superior Studios, Deluxe Studios, 2, 3 & 4 Bedroom Apartments, Executive Studios with Executive Lounge privileges, Loft Suites and Penthouses. All rooms and apartments include complimentary Wi-Fi and are spaciously appointed for a comfortable stay. The sought after location offers access to endless dining, nightlife and leisure attractions located at The Walk, JBR, The Beach and Dubai Marina, all within just a short walk from the hotel. 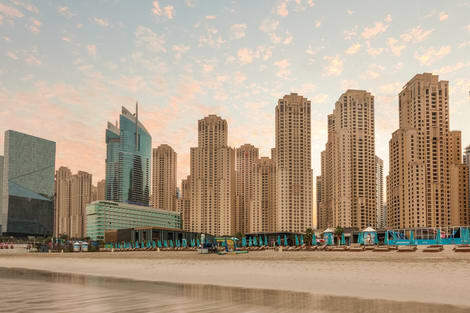 Ramada Plaza Jumeirah Beach is well connected to explore the city with a tram station located outside of the hotel and Jumeirah Lakes Towers (JLT) metro station under a 10 minute walk away. There are 3 golf courses within 5km of the hotel, 8 malls within a 10km radius and a number of theme parks and water parks located a short distance away, making Ramada Plaza Jumeirah Beach a great option for those wanting to discover some of the many attractions Dubai has to offer. 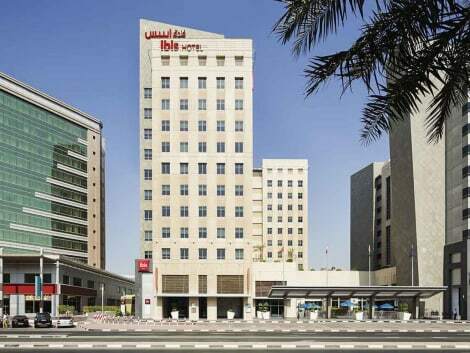 The 4-star Novotel Deira City Centre is located in the business and commercial district of City Centre Deira facing City Centre Deira Mall.with easy access to all iconic locations thanks to the city's metro service which is 2 minutes from the hotel. Breeze Bar serves a range of poolside beverages and snacks, so you can sit back and relax at Novotel. Enjoy recreational amenities such as an outdoor pool and a fitness center. Additional amenities at this aparthotel include complimentary wireless Internet access and concierge services. With a stay at Royal Falcon Hotel, you'll be centrally located in Dubai, a 3-minute drive from Al Ghurair Centre and 11 minutes from Gold Souk. 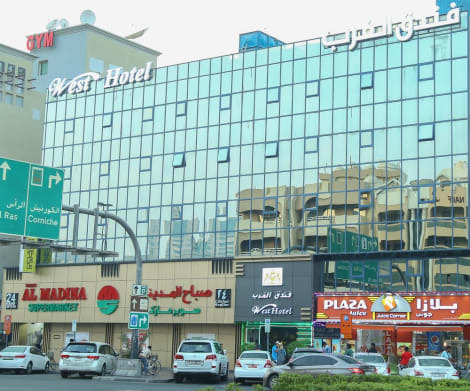 This hotel is 2.8 mi (4.6 km) from City Centre Deira and 3.1 mi (4.9 km) from Dubai Creek. Make yourself at home in one of the 69 air-conditioned rooms featuring refrigerators and flat-screen televisions. Complimentary wired and wireless Internet access keeps you connected, and cable programming provides entertainment. Private bathrooms with bathtubs or showers feature complimentary toiletries and hair dryers. Conveniences include desks, and housekeeping is provided daily. The facade of the hotel blends in with the other buildings in the neighbourhood being mid-sized, with around 5 storeys. Enjoy international cuisine at Crystal, one of the hotel's 2 restaurants, or stay in and take advantage of the 24-hour room service. Snacks are also available at the coffee shop/café. Buffet breakfasts are available daily from 6:30 AM to 10:30 AM for a fee. Experience Dubai's fashionable Jumeirah district when you stay at the Holiday Inn Express Dubai-Jumeirah Hotel, close to the Beach and World Trade Centre.A warm welcome awaits you behind the striking geometric facade of Holiday Inn Express Dubai-Jumeirah, 20 minutes by taxi from Dubai Airport. Our location overlooking Port Rashid Docks is just 3km from the World Trade Centre and a short complimentary shuttle ride from Jumeirah Beach. Kick-start your day with a Complimentary Hot Buffet Breakfast in the vibrant Great Room and stay connected with Complimentary wireless Internet in the spacious Lobby or in-room Internet.Welcome up to 50 delegates to your presentation in one of our 2 naturally lit meeting rooms or use the facilities in our 24-hour self-service Business Centre to prepare for your meetings.Our friendly 24-hour Front Desk staff are happy to help you plan your day, from providing Jumeirah Beach and shopping shuttle times to organising desert safaris. Enjoy a night in Downtown Dubai or Madinat Jumeirah's chic bars and restaurants. You can mingle with friends till 2am in our Lobby Bar and enjoy international cuisine in the Great Room for lunch and dinner.